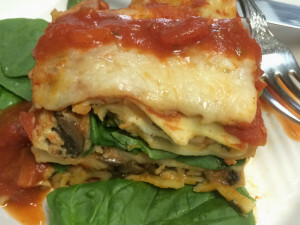 Lasagna was a regular meal in our household, along with most every Italian dish you can think of. When my husband cooked, it always seems like we did it all. Two huge pots of his homemade pasta sauce, meatballs, sausage, even ribs and chicken legs. Then as long as we were at it, may as well make eggplant parmesan and lasagna. The aroma of garlic lingered for days, much like an Italian deli. Back then we would use a meat sauce or sometimes even slice sausage into the lasagna. These days since I try to eat much less meat, I’ve turned his recipe into a vegetarian version (at least for those who still eat cheese). The vegetables included add so much flavor that the meat isn’t missed for a second. Since I now cook for only one or two, using a jar of pasta sauce works better for me than making sauce from scratch. You can use homemade or your favorite sauce. I enjoy a marinara sauce with olives and cabernet included. The seasoning in the sauce make any other spices unnecessary, which is why the oregon and basil are optional in the recipe here. It is still a rich and delicious meal, that may be served on its own or with a salad. If you enjoy meatballs or sausage, you can add them on the side. The same with garlic bread. I love spinach (in case you haven’t guessed by now), so I like to add even more to each layer. You can use more or less to your liking. In a skillet over medium-high heat, cook mushrooms, onions, and garlic in olive oil for 4 to 5 minutes. Drain excess liquid and cool. Wilt spinach for 2 minutes, either in pan or in microwave . Drain, then squeeze out excess liquid. Combine ricotta cheese, Romano cheese, oregano, basil, pepper, in a bowl. Spread a thin layer of sauce across the bottom of a greased or pan sprayed 9 x 13 baking dish. Lay 4 to 5 lasagna noodles in bottom of a 9x13 inch baking dish. Spread one third of the cheese mixture over noodles, then ⅓ of the spinach and ⅓ of the mushrooms. Sprinkle ½ cup mozzarella cheese on top. Spread ⅔ to 1 cup pasta sauce over cheese. Repeat layering 2 times, then top with sauce and an additional ½ cup of mozzarella. A pan like this one by Cuisinart is probably one of the most important needs for a great lasagna. It’s important for the depth of the pan. If you use too shallow a dish, the topping may end up over the height. When you cover it with foil, it can easily stick. That makes it good for any casserole you wish to bake. 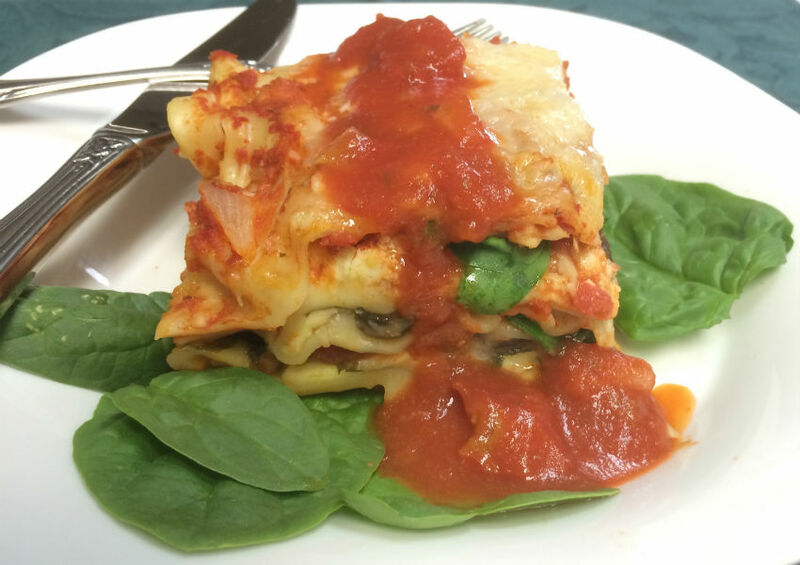 Make it easy on yourself when you are ready to serve the lasagna. This handy metal spatula from OXO will cleanly slice and remove the serving from the pan.